So many times the bean counters in the film business get criticized for inhibiting great art. Such and such movie could’ve been so much better if we had the money to hire this guy or the time to shot this complicated scene. The special effects would have been so much more special if we just were given an extra $40 million. Godzilla vs. Megalon then is a breath of fresh air where budgetary constraints acted to give us the greatest of all early 1970s Godzilla movies featuring Gigan! Who says you need a whole freaking month to make a movie about costumed stuntmen bumping into each other? Godzilla vs. Megalon? Three weeks! And most of that time was spent getting the guys in the monster suits! And what about the monster suits? The Godzilla suit was finished in only a week and was built so fast the eyes didn’t even work! And who cares about eyes since Godzilla shoots his radioactive rays out of his mouth! Even the starring monster Megalon is a bargain! He was supposed to be in the previous film (Godzilla vs. Gigan) but got laid off before filming started because they didn’t have enough money for three evil monsters in that movie! So you know he wasn’t commanding top dollar when he agreed to appear in this movie! Godzilla vs. Megalon delivers all sorts of bang for your buck right from the get go, too! A kid on a funky paddle boat trying to outrun a big whirlpool? Rescued by his two adult males friends? With a harpoon gun, right before all the water gets drained out of the lake? That’s like ten James Cameron movies right there! And for only the cost of the paddle boat rental! Back at home, the kid and one of his dads gets kidnapped and hauled off in a big metal container on the back of a truck. Their robot, Jet Jaguar, is stolen and it isn’t long before someone is trying to dump the metal container off below a dam. The other dad shows up to save the day, but the container gets dumped anyway! Just when all seems lost, Megalon shows up and saves them! But isn’t he a bad guy, you ask? Hey, one man’s evil monster is another man’s Seatopian freedom fighter! But what’s a Seatopian? Seatopia is one of those loser continents that couldn’t hang with the big boys and sunk to the bottom of the sea. Somehow the people managed to survive and are in contact with various monsters that they can summon whenever they get irked at the outside world. In this case, they’re crybabying about a little atomic testing that the Japanese are doing, so they beep Megalon on his pager and tell him to get his sleeping tail into gear and go tear some stuff up. Megalon is one of those directionally-challenged monsters who doesn’t know exactly where Tokyo is (shoot, the last time he was awake, it was probably a big stinky swamp) so they have Jet Jaguar show him the way. The good guys regain control of Jet Jaguar and tell him to ditch Megalon and fly over to Monster Island to get Godzilla. This Godzilla is our greatest Godzilla yet, as he looks pretty friendly and listens to what Jet Jaguar has to say through a cacophony of hand signals that reminded me of a backup quarterback sending in the play to the real quarterback. Godzilla takes in everything that Jet says with his gloved hands, nods, hops into the water and starts wading toward battle with Megalon. Megalon is a giant cockroach with drill bits for hands and an antenna on his head that shoots out lasers. He also can barf up these little red hairballs that explode. 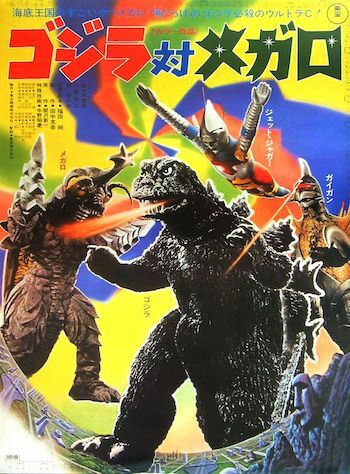 The Seatopians realize that maybe Megalon is going to have trouble handling a veteran like Godzilla and a young up and comer like Jet Jaguar, so they get on their cell phone and dial up their pals in space (underground civilizations almost always have good relations with races of aliens) and ask if they can borrow Gigan! Naturally, I had forgotten everything about Godzilla vs. Gigan as soon I finished watching it, but I was sure that he gave Big G everything that he could handle in their last match. I also recalled that Gigan had a big buzzsaw in his chest that he used when things got dicey, so I figured Megalon was in good hands with his new partner. Boy was I wrong! A lot of times, Godzilla gets his rump wasted pretty good (and usually loses the first match) in his movies, but this was one time where he pretty much dominated from the start (Megalon did manage to trap Godzilla and Jet Jaguar in a ring of fire though) and didn’t quit until Jet Jaguar threw Gigan into the air and Big G hit him with some of that chronic halitosis he’s famous for. It all ends with a couple of flying dropkicks and a handshake between Godzilla and Jet that leaves no doubt that Godzilla is firmly on our side and will always be there when some little kid in short pants gets harassed by aliens or underground bullies. A short and to the point film about the value of friendship and being bigger and stronger than anyone else, Godzilla vs. Megalon only seems to be a wispy shadow of supposedly more substantial earlier efforts in the series. What it actually is, is an economical distillation of everything these movies were always about anyway (monsters beating the tar out of model military vehicles and each other) without all the babble, subplots, and preliminary bouts the other movies frequently resorted to in an effort to fatten their running time. Godzilla SHOOK hands? WTF? Isn’t he supposed to be just some kind of mutant lizard? I guess it was a time when the studio was trying to milk Godzilla by making him more kid-friendly.